T.H. Williams Books | Young Adult Books | Books For Teens Outlander, Showing Men how to Once Again be Men. I’ve lost count of how many hours I’ve spent reading the Outlander book series or watching the TV show. Some nights I’ve woken from riveting dreams where I’m standing at Jamie Fraser’s side, sword in hand, battling the English, the war cry of the Scots lingering in the recesses of a mind that is having trouble finding its way back to the present. I can still smell the blood of battle as I carefully search to make sure all my limbs are still attached. I myself have done as Claire did and travelled through time. Though it was only in dream, I am drenched with sweat, the realism of it setting a fire blazing in my stomach, it bites at me, knotting my insides with a feeling that perhaps I was a Highlander somewhere in a past life. I can feel my heart beating faster, my inner beast trying to escape. I am free in a way that I have not known, free to be a real man, to stand in the strength of my courage, it is a freedom that the modern world has stripped away from me. No longer do we fight like the Scots did, for freedom or family, to see our farms safe or our way of life left alone. Now wars are fought for corporations under the not so convincing guise of politics––I guess, not too dissimilar to the English at that time. Men no longer stand toe to toe with those who would wish to oppress them, sword in hand waiting to hear the cry of charge. Instead we shoot a man from a distance, or send in a drone and bomb a village full to the brim with innocent women and children. Of course I respect the hell out of the soldiers that risk their lives to fight in the modern world, it takes immense strength to do what they do, it is not them I blame, it is the bureaucrats that would send them in the first place. All under the pretence that they are serving their country, when reality tells us it is simply to line the pockets of the wealthy elite. The world has lost its way. But once I get back into the pages of Outlander I forget the state of the world for those hours and find myself transported back to a time when the safety of my family rested solely on the tip of my blade. I could protect my wife, standup for her honour without being called sexist or told that a woman doesn’t need a man to speak for her. Despite its lack of modern comforts, it’s a time I wish I’d known and thanks to the remarkable Diana Gabaldon and her books, not to mention the brilliant retelling of the TV show, this is a world that I now have a better understanding of. It transports us to a time and a place that we will never truely understand, giving us a perspective on a way of life which was unique. It may have been brutal at times, but the Highlanders knew honour and valour, kinship and revelry, they lived every moment as if it were their last and fought for a sense of freedom that we now take for granted. This is no more prevalent than in the character portrayed so wonderfully by Sam Heughan: James Alexander Malcolm Mackenzie Fraser, who not only shows his undying love for his English wife, but for his country, his men and his family. He is the epitome of what a man should be. I applaud the author for creating a character with so many layers and such inspiring depth, he is a man that men, women and children alike would revere––he has all the values any man would wish for in their sons. We now live in a time where every little thing we say or do is scrutinised, we can’t do this, we can’t say that, it’s confusing people, they don’t know how to act without offending some group or person. We have forgotten what it is to live because we are so worried about upsetting someone. I am writing this for the young men of this world, imploring you to take the time to read one of these books or watch the show. If every man treated their wives as Jamie does Claire, than I’m sure there would be a lot of happy women in this world. He loves her so deeply, would die to keep her safe, to keep his child safe, he shows strength in the face of adversity and smiles at the waiting face of death. Not only does he value his wife above all else, he does it by standing tall in his own strength. He does not give himself away or backdown when she herself finds her voice (which she often does), he does not strike her––apart from the odd spanking––belittle her or speak down to her, yet he manages to keep the grit and force that makes a man a man firmly intact. If all men could find a little bit of Jamie Fraser in them, a little Highland honour, then the world would be a much better place. But don’t take my word for it, find a little time, read an Outlander book, watch an episode of the show, allow your inner mind to wander to a time when the strength of your courage was not in the size of your wallet, but in the pride of protecting those closest to you. Outlander will take you on an adventure as surely as it will break your heart, but for all the men who think it is a book for women, you are sorely mistaken––it is in fact the handbook on how to be a man. Find your war cry, find your passion and take a moment to bask in the strength of your own solitude. Push yourself into the pages and let the world melt away, you will come out the other side with a power you had forgotten you possessed. 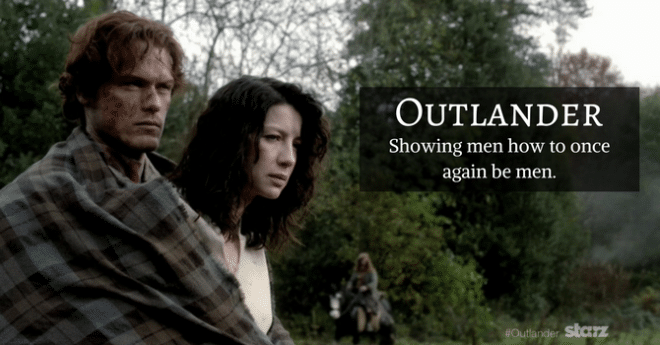 You will come out the other side knowing that Outlander has changed your life for the better.